The Dynamic Duo known as Batman and Robin have returned to Gotham after a year of absence. During that time Harvey Dent was left as the city’s protector. 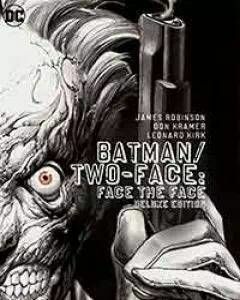 Batman and Robin find that some of their most notorious foes are being brutally murdered--forcing Batman to question if the man he entrusted to carry on in his place has confused justice with vengeance. Written by legendary author James Robinson (STARMAN), this deluxe hardcover edition collects the classic storyline from DETECTIVE COMICS #817-820 and BATMAN #651-654, as well as never-before-seen sketches!